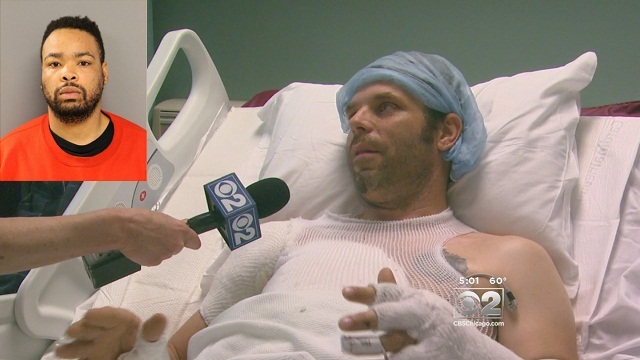 A group of "documented gangbangers" in Chicago allegedly ran over a white cyclist on purpose, dragged him for blocks and fought with police and firefighters, only to be let off easy with misdemeanor charges. If the races were reversed in this story, Chicago right now would be burning to the ground. BRIDGEPORT — The "senseless" car crash that seriously injured a McKinley Park man while he was riding his bike through Bridgeport has neighbors worried and authorities seeking harsher charges for the men involved. Scott Jacobson, 47, was riding his bike west on 35th Street at 6 p.m. May 2 when a black SUV heading east made a U-turn and plowed into him before dragging him for blocks. Jacobson, who was riding home after dropping his kids off at wrestling practice, was seriously injured but is expected to recover. A GoFundMe account set up by neighbors has raised over $38,000 for Jacobson. The black SUV that hit and dragged Jacobson was driven by Joshua Thomas, 26, who was with a group of other men police said were documented "gangbangers," according to Officer Martin Loughney at a Deering District CAPS meeting Tuesday. "The gangbangers saw him and thought, 'I'll just run him over,' " Loughney said. "This is just senseless." Jacobson was dragged to 35th Street and Lowe Avenue, where his screaming caught the attention of firefighters, Loughney said. Loughney said that the men inside the SUV tried to thwart firefighters and even clashed with police once they arrived. One of the men tried fleeing the scene, Loughney said, even though the man was partially paralyzed in a drive-by shooting and had no use of his legs. "He did not get far," Loughney said. Thomas and his friends only face misdemeanor charges, Loughney said. Thomas faces charges of reckless driving and driving without insurance, among other charges, and is no longer in police custody. The announcement of the charges drew an audible reaction from the crowd at the CAPS meeting. Ald. Patrick D. Thompson (11th) said state prosecutors "are hoping to upgrade those charges." Here's the family's GoFundMe campaign. Can you imagine what would be happening right now if the races were reversed? This story would be on every major news channel 24/7 for a week. Chicago would be being burned to the ground. Prosecutors would be seeking the death penalty and the "white supremacists" would be accused of attempting a lynching. Instead, the story has gotten only minor local coverage and these attempted murderers who should have been hit with hate crime charges were let off with mere misdemeanors.